It seems a mistake to call him a realist in any but the loosest sense. 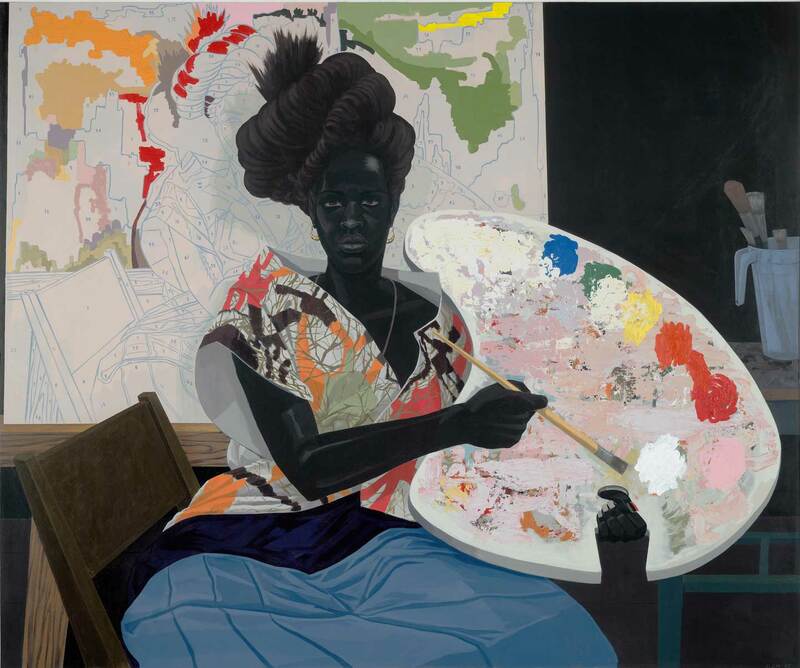 The main attraction at the Met Breuer these days is “Mastry,” the big Kerry James Marshall retrospective that has recently moved there from the Museum of Contemporary Art, Chicago, and which will travel to the Museum of Contemporary Art, Los Angeles, this spring. But for those who went to see it up to the day after New Year’s, I was giving this advice: First, go upstairs to the fifth floor, where you’ll find an exhibition of some 70 works by Paul Klee, all culled from a group of 90 donated to the Metropolitan Museum of Art in 1984 by the German art dealer and collector Heinz Berggruen. There were a couple of reasons to start with Klee. The first was scale. The works of the great Swiss modernist are all quite modest in size; they invite you to come in close to appreciate their nuances. Most of Marshall’s paintings, by contrast, are on a grand scale, as befits his ambition to create a kind of contemporary history painting, and they are best taken at some distance. But the more important reason to have seen Klee first was that it might have helped you understand Marshall better. The two artists share more in common than might be apparent at first sight. An encounter with Klee’s delicate balances—between earnestness and wit, didacticism and playfulness, representation and abstraction—could give you a keener appreciation for Marshall’s poise in handling similar dichotomies. The arrow ostentatiously pointing to a seemingly random spot in Klee’s Stricken City (1936); the funny mix of embarrassment and pride on the face of the titular figure in Boy in Fancy Dress (1931), almost invisible amid a mosaic-like grid of little colored rectangles; the abstract narrative of Episode Before an Arab Town (1923)—­ I couldn’t help but think that Marshall might feel a kinship with any of these, or even that the tiny gouache Temple Gardens (1920) could have supplied the compositional template for one of Marshall’s own “Garden” paintings, grand and bannerlike though they may be. Of course, Marshall can elect his own affinities, and he’s done so in a small exhibition of works from the Met collection that he’s installed to the side of his own exhibition. It doesn’t include Klee, but it’s a catholic mix, ranging from modernist abstraction (including a lovely, lyrical 1950 Ad Reinhardt that makes you wonder how he ever turned into the implacable maker of nearly uncommunicative black paintings within just a decade) to Renaissance allegory (such as Albrecht Dürer’s celebrated 1513 engraving The Knight, Death, and the Devil). And then there’s the pantheon of great postwar African-American artists—Jacob Lawrence, Roy DeCarava, Romare Bearden—as well as Japanese prints and African sculpture. Some of Marshall’s choices seem idiosyncratic, such as his inclusion of a painting by the corny American magic realist George Tooker, or Jean-Auguste-­Dominique Ingres’s strange grisaille remake of his own famous Grand Odalisque (though this might explain something about Marshall’s interest in how color can function as a fiction or artifice). However, the message of the side exhibition is clear and helps us understand what Marshall is up to: remaking the art museum. Helen Molesworth, one of the exhibition’s curators (along with Dieter Roelstraete and Ian Alteveer), takes such statements as evidence that Marshall’s work is best seen “as a form of institutional critique, a profound querying of the museum through its most privileged object: painting.” But Marshall’s statements don’t sound that way to me, nor do I think his works uphold the proposition. Marshall was born in 1955 in Birmingham, Alabama, but he grew up mostly in Los Angeles, where his family moved to in 1963. He graduated from the city’s Otis Art Institute in 1978 before moving to Chicago in 1987. At the institute, Marshall’s teachers included two important African-American artists: Charles White, who had been a WPA muralist, and Betye Saar, an assemblagist whose works often challenge the absurdity of racial stereotypes. In retrospect, Marshall’s mature work might be seen as a synthesis of their seemingly disparate approaches, bringing together White’s idealism and Saar’s incisive wit. Another important teacher and influence in his early years was Arnold Mesches, a New York–born painter who treated contemporary social issues with a minatory, sometimes lurid surrealism. Marshall himself has gone on record as wanting his work to be seen as “a continuation of painting as it was practiced from the fifteenth to the seventeenth centuries,” and so it’s unclear why he would see “belatedness” as an obstacle for other artists but not for himself. In any case, many of his most brilliant moments come just when he gives himself over to abstraction. The gorgeous 2003 Chicago cityscape 7am Sunday Morning is descriptive enough on its left half, but its right side becomes an excuse for a kind of light-infused geometrical abstraction that, I believe, pays homage to the unexpected beauty of the moment. Dare I speak of a moment of transcendence? There are things that can’t be represented, only evoked. Great art, of course, can grow from contradictory ideas, and my complaints about Marshall’s sermonizing on abstraction would be irrelevant if the authority of his ideas weren’t magnified by the power of the works he’s made. A couple of recent untitled “blot” paintings—symmetrical compositions of splotches in luridly acidic color, like Rorschach tests reinterpreted after Gerhard Richter—suggest that Marshall was justified in his early recognition that his future would not lay in abstract painting. Yet his particular approach to figuration could never have evolved without it; neither could his “redirecting” of found imagery so that it becomes something other than previously intended. Marshall was right when he argued that “we would never have heard of Bearden had he not abandoned abstraction for the representational collages with which he has become synonymous,” and something similar can be said of Marshall himself; but this is a matter of the individual artist’s personal capabilities and inclinations and not a matter of artistic or sociopolitical necessity. It’s just a short step from these emblem­atic black figures—solemn, monumental—to Kara Walker’s grand-scale black cut-out silhouettes, but it’s a step that Marshall would not take. Walker’s silhouettes can, in their own obscene way, induce a nervous laughter. Her art spares no one from indignity; it offers no heroes. In an almost nostalgic way, Marshall upholds the idea that a positive stereotype can be promoted, one in which “extreme blackness plus grace equals power.” For Walker, the fantasy of unitary blackness does not hold out a promise of redemption; it is always mired in abjection. Marshall’s work gets its power from precisely the hope that the opposite might be true—a hope that in the present seems distinctly less tenable than it did when his show opened at the Met Breuer back in October. But if the protagonists of Marshall’s paintings often radiate a sense of seriousness and dignity, he also places these grave figures in pictures that are filled with sly wit and willful incongruity. Consider an untitled painting from 2008, showing a painter who stares straight out of the canvas at the viewer while holding the traditional attribute of his profession, a palette—but this palette is enormous, bigger than the artist himself. There’s something absurd about it. Whatever message you try to derive from it (the black painter must heroically uphold a vast tradition that challenges his very strength to sustain?) seems so much less compelling than the outrageousness of the image as an end in itself. The painter has his brush trained on a big spot of black paint, as if he were loading up the brush to paint… himself? The implication, then, would be that while appearing to stare out at us, the viewers—challenging us—he is perhaps instead staring at himself in a mirror, preparing to paint a self-portrait. And yet, despite this figure being at the center of both the painting and the work in progress, he is, in a way, merely the support for the most eye-catching part of the painting: the colorful mass of nonrepresentational paint that covers his palette, a sort of gestural abstraction in itself. Here, representation and abstraction seem to be making sport of each other, and one is left wondering what the aspirations of a painter could amount to. In another portrait of an imaginary painter, this one from 2009, an impressively coiffed and decked-out woman wields a palette that’s not quite as vast as the previous one, but still far larger than could ever be conveniently handled. Behind her, we see the canvas she’s working on: a self-portrait, laid out as a paint-by-numbers outline. Is the implication that she’s dressed for the role of grand dame of art but hasn’t the skill or the originality to do it on her own? I don’t think that’s it exactly, and yet the painting suggests that the power of representation is not sufficient to escape the conundrum of belatedness that, in Marshall’s view, bedeviled many of the black abstractionists. The outrageous self-possession of his woman portrait painter is not, after all, undermined by the presence of the apparently ready-made canvas behind her: Someone realized she was important enough to make a paint-by-numbers kit of her. Or maybe she designed it herself. Either way, the formidably stern, uncompromising expression on her face as she stares defiantly at the viewer doesn’t suggest that she will be easily denied. For Marshall, it seems, the strength of a painter is the ability to absorb all the ironies with which history has burdened her while retaining a blunt, enigmatic authority. It’s a formula that fits his own art perfectly.